Have you ever fantasized about travelling for extended periods of time and visiting amazing new places? Have you thought about leaving the stresses of your job and daily life? Has the idea of living in a van and spending weeks, months or even years on the road doing the things that you love ever crossed your mind? for self reflection and an appreciation for the simple things in life. Living in a van can give you time to do the things that you’ve always pushed aside due to work and other life commitments. 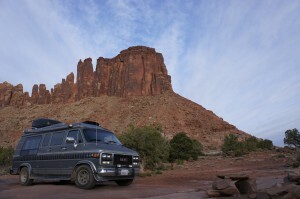 You’ve decided that you want to try living in a van as a temporary or permanent lifestyle. There’s a lot to know about van living and this site should help to educate you on a variety of aspects related to full or part time van life. Van living can be a lot of fun but it can also have it’s challenges. If you set your van up properly the first time you will find life on the road to be more enjoyable and carefree. As with any major lifestyle change there are a lot of things to consider and a lot to learn before diving in. Without proper planning you will find a lot of the easy daily tasks that you may take for granted now might be a significant challenge later. From cooking and cleaning to showering and food storage there are a lot of variables that if done correctly can make living in a van a much more comfortable existence. Wether you’re starting with a small budget or a large one, you can outfit any van for comfortable living. From buying your van to setting it up for life on the road, you will find the information here at Van Living. Get Your Free Copy! Sign Up Here! Proudly powered by WordPress | Theme: Flask by basilosaur.us.